Excavations at two quarries in Wales, known to be the source of the Stonehenge 'bluestones', provide new evidence of megalith quarrying 5,000 years ago, according to a new UCL-led study. Geologists have long known that 42 of Stonehenge's smaller stones, known as 'bluestones', came from the Preseli hills in Pembrokeshire, west Wales. Now a new study published in Antiquity pinpoints the exact locations of two of these quarries and reveals when and how the stones were quarried. The discovery has been made by a team of archaeologists and geologists from UCL, Bournemouth University, University of Southampton, University of the Highlands and Islands and National Museum of Wales, which have been investigating the sites for eight years. Professor Mike Parker Pearson (UCL Archaeology) and leader of the team, said: "What's really exciting about these discoveries is that they take us a step closer to unlocking Stonehenge's greatest mystery - why its stones came from so far away." "Every other Neolithic monument in Europe was built of megaliths brought from no more than 10 miles away. 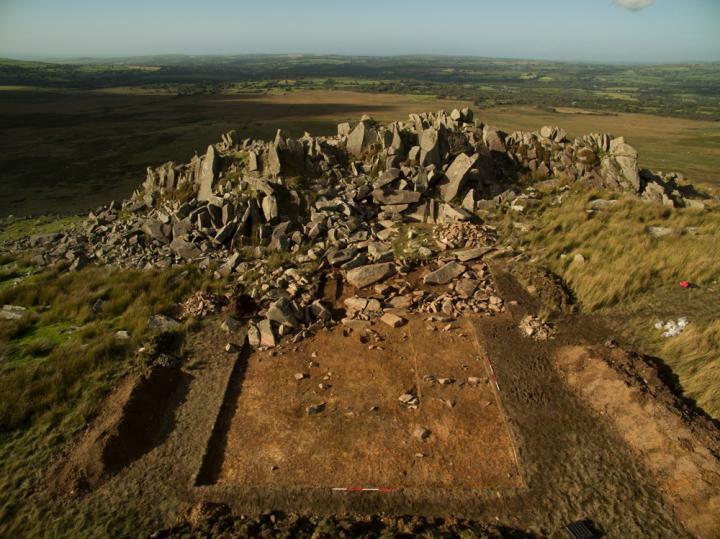 We're now looking to find out just what was so special about the Preseli hills 5,000 years ago, and whether there were any important stone circles here, built before the bluestones were moved to Stonehenge." The largest quarry was found almost 180 miles away from Stonehenge on the outcrop of Carn Goedog, on the north slope of the Preseli hills. "This was the dominant source of Stonehenge's spotted dolerite, so-called because it has white spots in the igneous blue rock. At least five of Stonehenge's bluestones, and probably more, came from Carn Goedog," said geologist Dr Richard Bevins (National Museum of Wales). In the valley below Carn Goedog, another outcrop at Craig Rhos-y-felin was identified by Dr Bevins and fellow geologist Dr Rob Ixer (UCL Archaeology) as the source of one of the types of rhyolite - another type of igneous rock - found at Stonehenge. According to the new study, the bluestone outcrops are formed of natural, vertical pillars. These could be eased off the rock face by opening up the vertical joints between each pillar. Unlike stone quarries in ancient Egypt, where obelisks were carved out of the solid rock, the Welsh quarries were easier to exploit. Neolithic quarry workers needed only to insert wedges into the ready-made joints between pillars, then lower each pillar to the foot of the outcrop. Although most of their equipment is likely to have consisted of perishable ropes and wooden wedges, mallets and levers, they left behind other tools such as hammer stones and stone wedges. "The stone wedges are made of imported mudstone, much softer than the hard dolerite pillars. An engineering colleague has suggested that hammering in a hard wedge could have created stress fractures, causing the thin pillars to crack. Using a soft wedge means that, if anything were to break, it would be the wedge and not the pillar," said Professor Parker Pearson. Archaeological excavations at the foot of both outcrops uncovered the remains of man-made stone and earth platforms, with each platform's outer edge terminating in a vertical drop of about a metre. "Bluestone pillars could be eased down onto this platform, which acted as a loading bay for lowering them onto wooden sledges before dragging them away," said Professor Colin Richards (University of the Highlands and Islands), who has excavated Britain's only other identified megalith quarry in the Orkney islands, off the north coast of Scotland. An important aim of Professor Parker Pearson's team was to date megalith-quarrying at the two outcrops. In the soft sediment of a hollowed-out track leading from the loading bay at Craig Rhos-y-felin, and on the artificial platform at Carn Goedog, the team recovered pieces of charcoal dating to around 3000 BC. The team now thinks that Stonehenge was initially a circle of rough, unworked bluestone pillars set in pits known as the Aubrey Holes, near Stonehenge, and that the sarsens (sandstone blocks) were added some 500 years later. "Some people think that the bluestones were taken southwards to Milford Haven and placed on rafts or slung between boats and then paddled up the Bristol Channel and along the Bristol Avon towards Salisbury Plain. But these quarries are on the north side of the Preseli hills so the megaliths could have simply gone overland all the way to Salisbury Plain," said Professor Kate Welham (Bournemouth University).